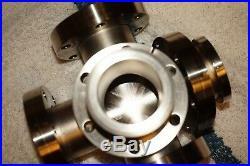 Stainless Steel high vacuum chamber with 2.75 Varian ConFlat flanges. 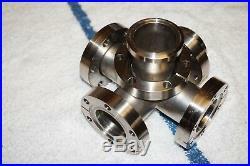 Two flanges are fixed type, and the other three are captive (loose) and can be rotated. 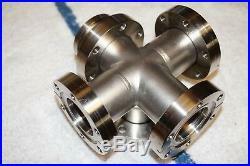 Flanges are 1-3/8" inside diameter and 2-3/4" outside diameter. 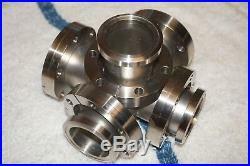 6 bolt holes in each flange. Face to opposite face measures 5. 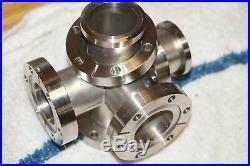 Perkin Elmer Varian Conflat Connector Flange Siemens 5100 4100PC Zeeman Atomic Absorption Spectrophotometer Zeeman HGA 600. Plasma Gas helium argon vacuum cvd semiconductor wafer silicon coatings reactor surface modification e-beam etching chemical process Microfabrication pvd metals graphene carbide materials science research deposition nano molecular layers abrasion electronics industrial aerospace engineering glassware chamber beam laser atomic ionic. High Voltage Power Supply, Laboratory, Electronics, Amperage, Direct Current, Mad Scientist, Frankenstein, Research, Semiconductor, Industrial, High Vacuum, Magnetron, Magneto, Magnet, Laser, Steam Punk, Theater, Stage prop, Motion Picture, Museum, Thomas Edison, Nuclear, Radiation, Tesla, Lightning. Instrument, Emission, Atomic, Absorption, Analysis, Analytical, AA, AE, Zeeman, Mossbauer, Ionization, Spectroscopy, Laser, Photon, Resonance, Proton, Electron, Optics, Spectrophotometer Laboratory, research, roughing, physics, chemistry, SEM, microscopy. 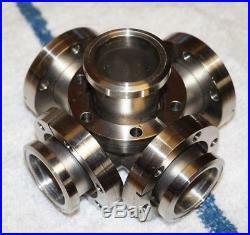 The item "Varian 5-Way Cross Vacuum Chamber ConFlat 2.75 5 Flanges (2-fixed & 3-loose)" is in sale since Friday, October 12, 2018. This item is in the category "Business & Industrial\Hydraulics, Pneumatics, Pumps & Plumbing\Pumps & Pump Accessories\Vacuum Pumps\Vacuum Chambers". 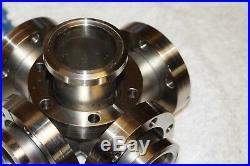 The seller is "docstill299n" and is located in Gainesville, Florida. This item can be shipped to United States.